Does anyone grow Giboshi aka Smith’s Best Asian persimmon? It’s listed as PVA pollination variant astringent. Just Fruits and Exotics lists it as “self fruitful” Mine is ten years old, healthy, good size but only five or six fruit hang on to maturity each year. Does this mean it needs a male pollinator? Or does the fact that it produces a few fruit mean that it does not need a male? I have a ten foot wide mulch circle under tree, then lawn. Could lawn fertilizer cause the non-fruiting problem. I have never understood persimmon pollination, it’s like greek to me. I also have a ten year old San Pedro Asian persimmon that also only keeps two or three fruit to maturity. I have a seedling native persimmon I could graft to male scions, assuming I can ever learn to make a persimmon graft take. OR if I just let my native persimmon grow would it pollinate my Asians? For what it’s worth, I have Chocolate and Coffeecake persimmons on lotus rootstock. To my suprise, they have survived the past few severe winters in my z7a backyard, and continue to put on modest annual growth despite the part-shade I’ve subjected them to. They have the queerest growth habits: the first flush of growth in spring is weeping - and the trees lean over all summer long - requiring support. The second flush of growth in late summer bolts straight up. Both have flowered a few times, but no fruit set yet. DWN of Calif rates these two as among the best tasting Asian simmons. this past spring, but did not set. Very helpful Matt, thanks. I think I’m concluding that Giboshi (Smith’s Best) will produce seedless fruit without a pollinator but if you provide a pollinator like Chocolate or Matsugata or Gailey the fruit will taste a lot better and be dark inside, with seeds. Matt- could I possibly get a few Chocolate scions from you in Feb? I could send you some Giboshi scions. Sure, I can send you a stick in Feb. I wonder if you could swap me an apple stick instead of Giboshi. Would you be willing to PM me a list of your apples big enough for a spare budstick? Maybe you could send me a stick of Brushy Mountain? I have not grown Giboshi, but have grown over 30 cultivars at some point or another, and below is my understanding, but I could well be wrong on some points. I think Giboshi would hold some fruit for you without Pollination as “Parthenocarpic” fruit but probably set and hold more fruit and the fruit quality would likely be different, hopefully better if seeded. Most Kaki are Parthenocarpic and will set at least some fruit without pollination, but might set more pollinated. PCNA pollination constant non-astringent The fruit has minimal differences if seeded, possibly a little larger if seeded. PCA pollination constant astringent The fruit will stay astringent whether seeded or not, the taste is astringent until the fruit softens up. PVNA pollination variant non-astringent The fruit will be astringent unless seeded, and often the flesh surrounding the seed will color to a brownish and will be non-astringent even while firm. If not seeded the fruit will remain astringent until it softens. If not fully seeded you might end up with a partially astringent fruit. PVA pollination variant astringent This is the one I am most unsure on. If the fruit remains astringent when pollinated/seeded how does it differ from PCA? I have always assumed there is a significant change in fruit quality hopefully for the better. -Excessive nitrogen will cause fruit drop but I am not certain a normal lawn application would. Pollinated seeded fruit will hold on tree better, as well as changing the quality of the fruit on PV Pollination Variant cultivars. -Other cultural influences such a drought and other stresses can cause fruit drop. I had a very dry may-July and dropped most my fruit this year on some cultivar. -Tree age. Fruit drop on young trees is common if not the norm. It’s unlikely your Native Virginiana would pollinate your Asian Kaki. There are hybrids of Kaki X Virginiana and some posts on them here, but the initial cross is not real easy as I understand. I did get seed set in my Nakita’s Gift hybrid with no effort not sure if male parent was a Kaki or Virginia from my woods, so at least some ensuing crosses at least pollinate easily. @strudeldog Man that’s a great explanation of persimmon pollination, thanks. From what I read most of the named Asian cultivars produce only female flowers and are self fertile. A few like Chocolate and Giant Fuyu (according to Cliff England) produce both female and male flowers so you get fruit on them plus they pollinate other pollination variant types like Giboshi. So I need to do a bunch of Chocolate grafts next spring and get them blooming ASAP. Will attempt to graft them on a two year old native rootstock. If I load it up with ten grafts I might get one or two takes. I have dismal record grafting persimmon. Not sure how well Chocolate would graft onto Virginiana. You might consider grafting some Chocolate directly onto the Giboshi scion to improve chances of a take. I will say I don’t grow many pollination variant types, as I prefer seedless or low seed count in the fruits. I have tasted both Chocolate and Nishimura Wase (coffee cake) that were excellent and some that were not so good, if they are not well pollinated I find them lacking compared to others. The big reason I don’t grow them is the seeds that I get not in them but in all my pollination constant trees that would otherwise be seedless. 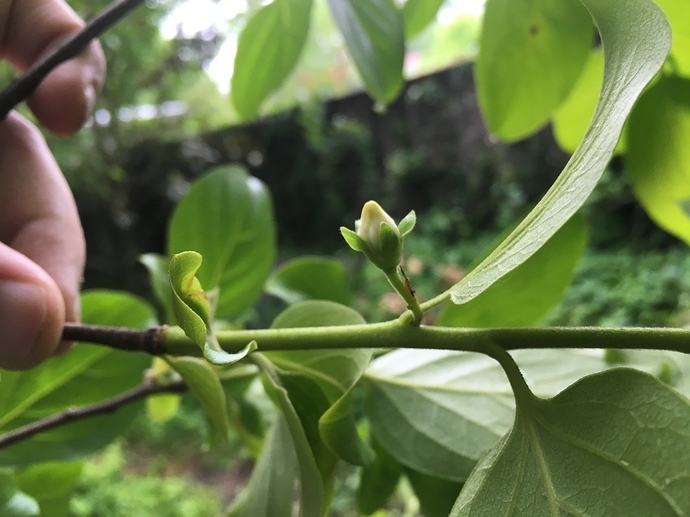 Last year I had lots of seeded fruit and this spring observed closer at bloom time and found a grafted cultivar from ARS UC Davis that I know little about covered with male blooms. I moved that tree to my back pasture hopefully out of pollination range. When or If I put back in some PVs it would be there. Not everyone has the space to separate them. I know I sent some scion out last winter to a couple folks that were grafting over Chocolate in frustrations with the seeds. I will say this year I have experienced much more fruit drop compared to last year. I think part might be related to drought stress, but thinking maybe more due to moving that male tree and my fruit I doubt have many seed this year contributed to the drops. As far as grafting I use a simple bark graft with pretty good luck, and relatively later than most things I graft. Ideally shortly after root stock is leafing out. It’s important to rub off growth regular from stock as I have seen others state here. My cabin is a good example of that. The last two years I have successfully grafted over some tree that died back to graft, but the grafts eventually failed as I was not there often enough to keep the below graft growth removed. Thanks for mentioning the concern that male pollinators will cause seeds in otherwise seedless persimmons. Hmmm. I have always assumed there is a significant change in fruit quality hopefully for the better. Yes, that is also what I heard somewhere. @hambone I would probably skip PVA types if you wanted to avoid seeds. Personally I like Chocolate so much and I think the pollination helps some of my other varieties so I am willing to put up with the seeds. I don’t know much about Giboshi… but I do think there is some value in pollination by male flowers in order to keep fruit. My Nikita’s Gift has dropped a lot of fruit over the past two weeks, which I believe is due to lack of pollination. My mature NG fruit from last year had seeds; however, as I cut into the ones that have fallen over the last two weeks, there is no sign of seeds at all. I did come across a blog post by Jerry Lehman where he mentions that NG does drop fruit in mid summer, which he believes is due to lack of pollination. The premature fruit drop is my biggest struggle with my persimmons! Good luck! Sounds like Chocolate is a good one so I’m going to go for it and not mind the seeds. I suspect once Chocolate blooms here both my Giboshi and obscure San Pedro will kick into production. So I may graft long scions of Chocolate hoping to speed up time to bloom. Great discussion, big help, thanks all. Assuming my tree stays alive I can send you some this winter. I am in the process of moving it over to a new root as the original tree is fading, I grafted it this spring on to the stump of my winter-killed Hachiya. Thanks Scott for your offer. I just talked to Just Fruit and Exotics in Florida and they said they’d provide me with all the scions I need. So am all set. Thanks. Chocolate is supposedly a heck of a male pollinator, it will cause seeds in persimmons in many a nearby tree. Which some people like, but not me! Are there other reliable male pollinators? Coffee cake, maybe eureka? Coffeecake is not known to be a particularly powerful pollinator.